Thank you for visiting my blog. This is a place for me to share some reviews, thoughts, and travel stories. I hope you will enjoy them. Hi everyone, my name is Frank and I am babieangie's personal photographer and chauffeur. 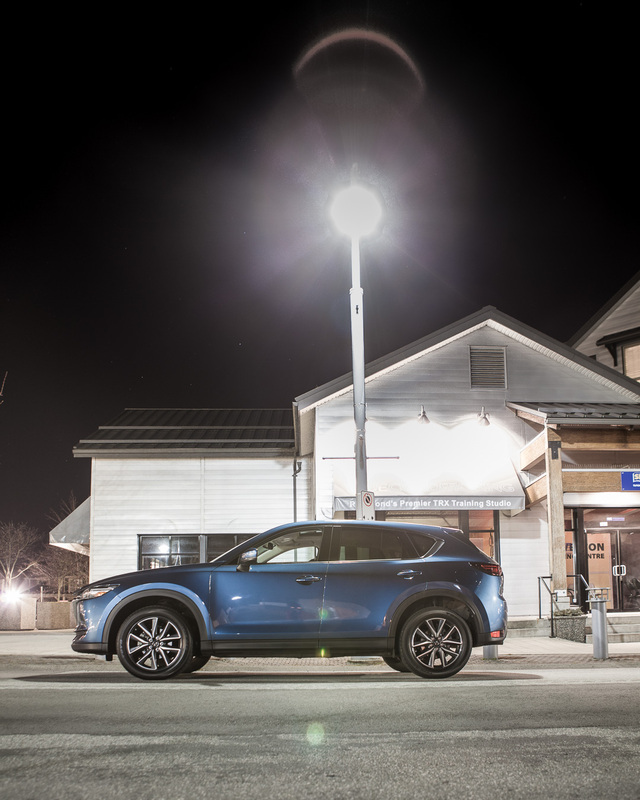 I have been a long time Mazda fan and always admired the company’s ability to innovate and its relentless drive to design cars that not only good looking, but also engaging and fun to drive. 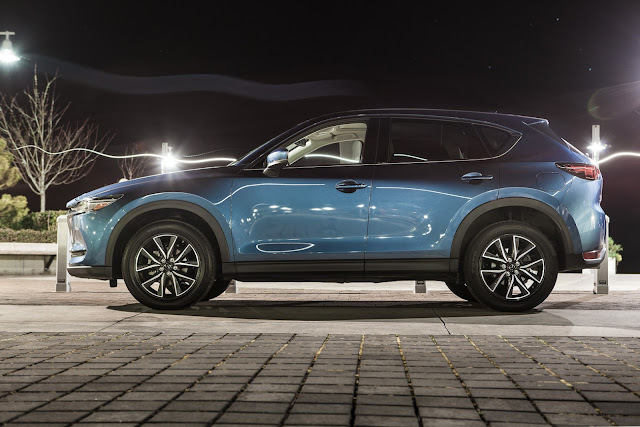 The test car we drove was a 2018 CX-5 GT with Eternal Blue Mica exterior and Pure White leather trim. It is equipped with Mazda’s newly updated 2.5L naturally-aspirated SKYACTIV-G engine that produces 187hp of power at 6000rpm and 186lb-foot of torque at 4000rpm. This engine features a new cylinder deactivation system, which shuts off two of the cylinders when the car is at cruising speeds. The design maximizes efficiency while providing the torque and power you need on demand. 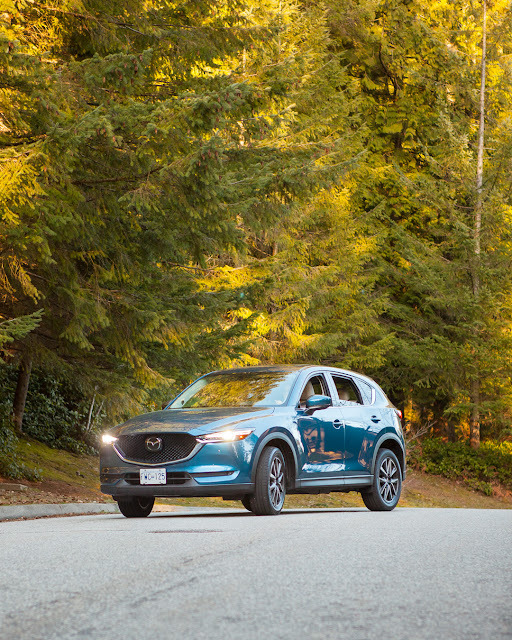 Another innovation that is incorporated into the 2018 CX-5 is the G-Vectoring Control (GVC). In simple terms, the engine senses when you are entering a turn and reduces torque. This shift in torque transfer the the weight of the car to the front tires, improving cornering responses. Once you have entered the turn, the engine shifts the extra load back to rear wheels, improving cornering stability. All these sound very technical and complicated, however combined with the active torque split all-wheel drive system, the only things a driver would notice are the improved handling, and fuel economy. The CX-5 handles the transition seamlessly. Mazda seems to have mastered its Kodo design language with the CX-5. Each year they tweak the exterior styling slightly to make it look more composed and refined. 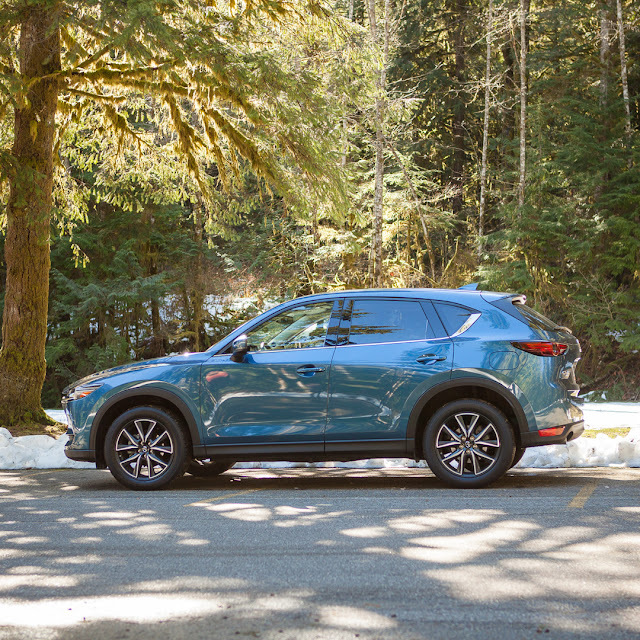 Mazda has found a perfect balance between aggressiveness and classic elegance for its 2018 CX-5. I love the way the front wheel arches blend into the side panels, and the seamless transitions from the front grill to the LED headlights. 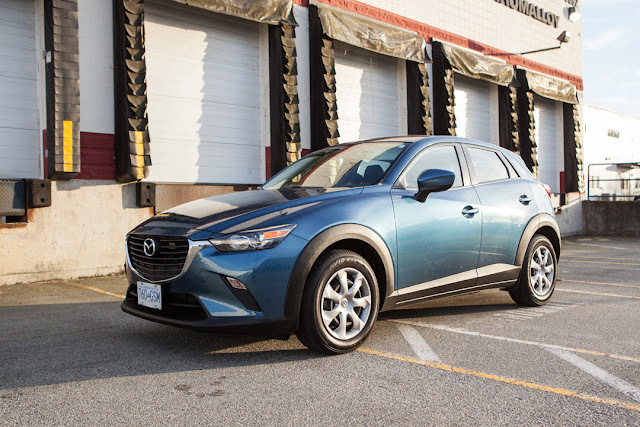 Mazda meticulously manipulate these accent lines to make the car look sharp and agile. It is easily the best looking car in the segment that competes with more premium brands. 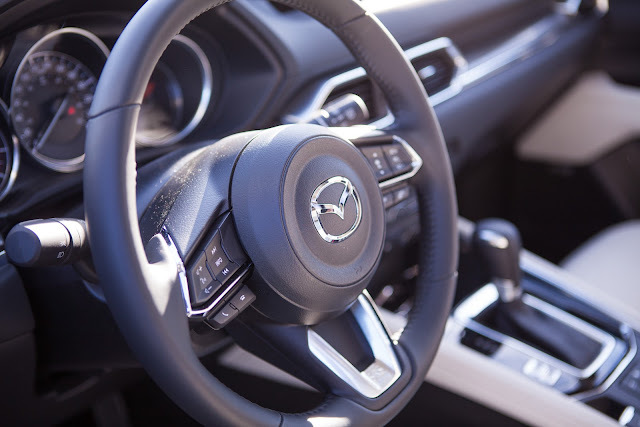 Not only is the exterior of the CX-5 beautiful, Mazda has also stepped up its interior design. It is simple, elegant, and driver-centric. If anything, maybe it is too driver-centric. We will get to that later. The GT trim features both heated front seats and heated rear seats. The seat is comfortable and the pure white leather upholstery feels premium. Soft-touched material is used throughout the deck and side trims. 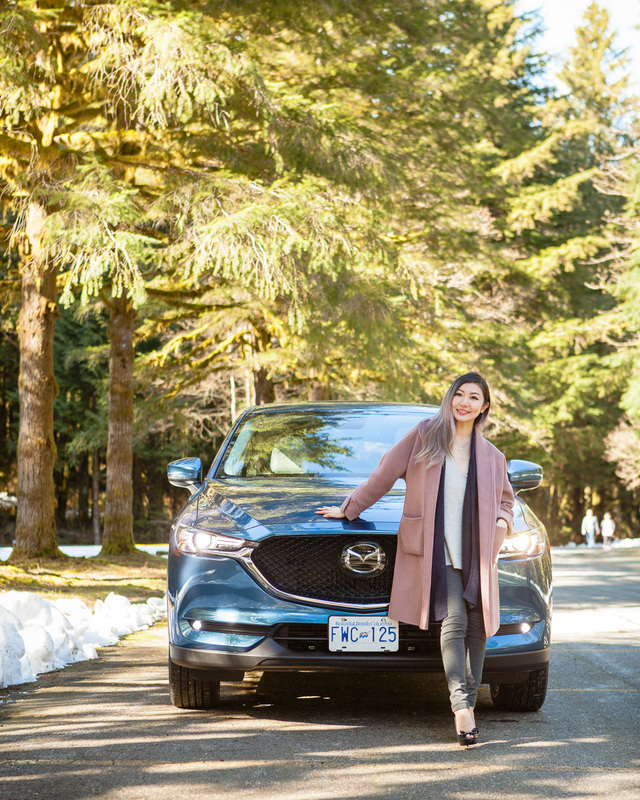 This give the CX-5 an upscale feel. The visibility from the driving position is good. The aggressive hood position does make looking at close objects in the front more challenging. I wish there is a 360-degree camera but it is something you get used to. 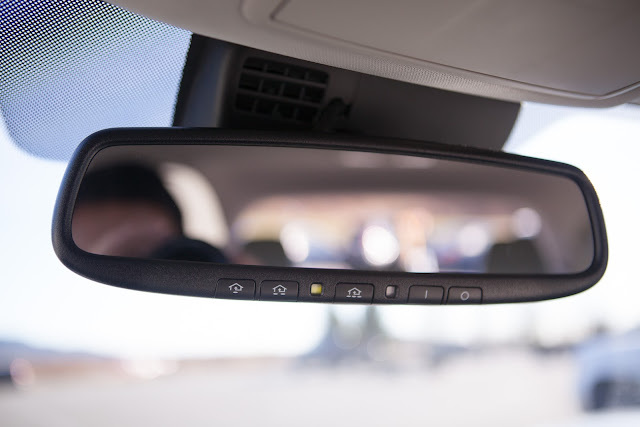 The view from the Homelink equipped rearview mirror is unobstructed. Mazda has also added more sound insulation to make the CX-5 quieter than the previous generations. 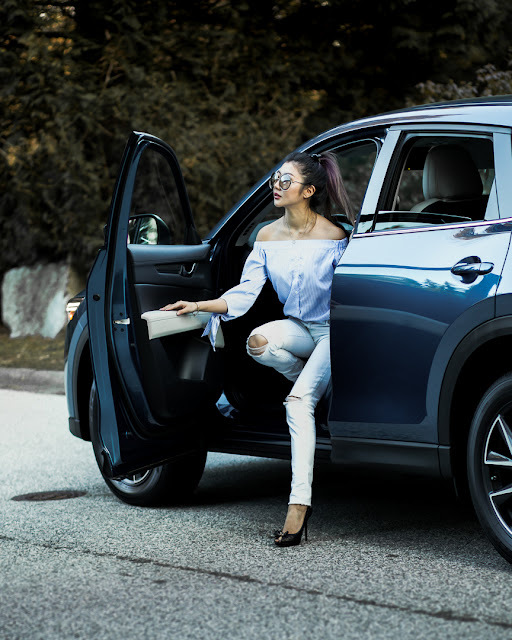 Overall, the interior of the 2018 CX-5 feels much more expensive than it is and puts it in the league of premium brands like Audi or Mercedes. 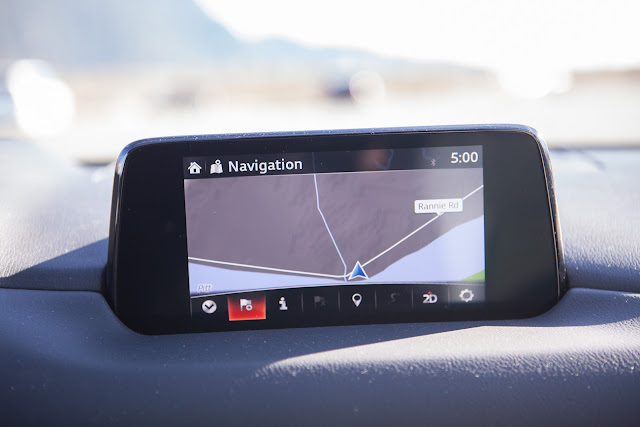 The infotainment display is large and bright, and the climate control system is intuitive. 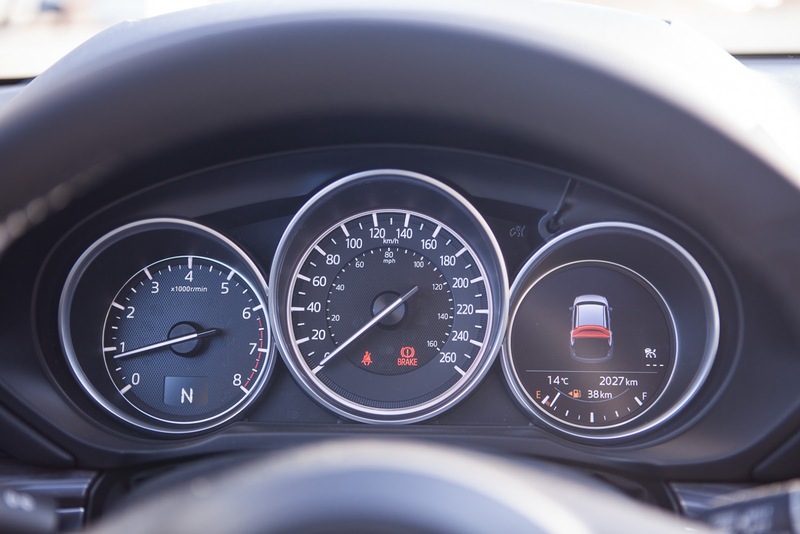 The right dial of the dashboard is electronic and you can control most of what you need directly on the steering wheel. 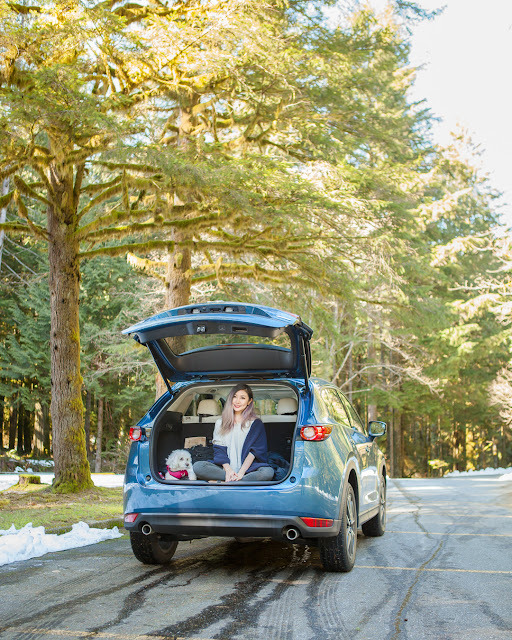 Our CX-5 is equipped with a 10-speaker Bose surround-sound audio system that sounds great. The physical control dial is positioned in a comfortable to reach location, and the button/dial layout is easy to get used to. One thing I do find annoying (and my point of the interior being too driver-centric) is that when the car is moving, the infotainment system locks out some of the options including changing the radio station. 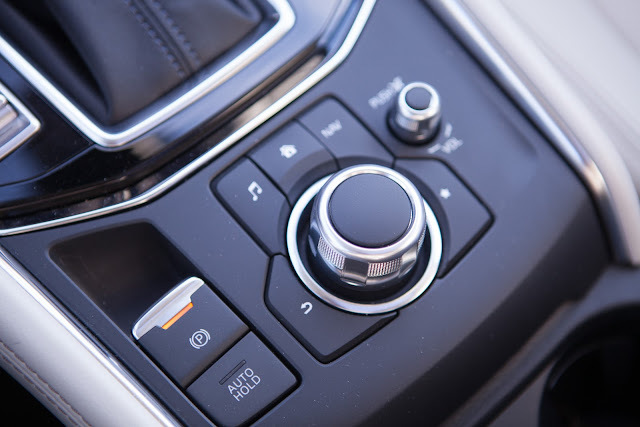 For the driver, you can use the control on your steering wheel to switch between presetted stations, but there is no way for the passenger to access those functions once the car is moving. I am sure this feature is implemented for safety reasons. However, I would much prefer a warning, or as a setting you can opt out of. I am very impressed with 2018 CX-5's advanced head-up display. In our CX-5 with the Technology Package, important information including vehicle speed, traffic sign information, and turn by turn navigation is projected directly onto the windshield. You do not need to move your eyes away from the road to access these information. This is such a useful feature that it was hard to adjust back after the testing period. The 2018 CX-5 was named a Top Safety Pick by the IIHS. 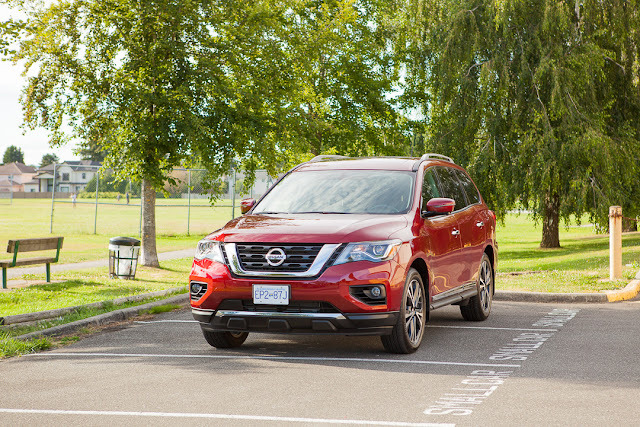 Blind Spot monitoring, Rear Cross Traffic Alert, backup camera, and Smart City Brake Support all come standard with every trim. It is rare to see all these options as standard in this price range. In our GT trim, there is also Adaptive Cruise Control and Lane departure Warning. 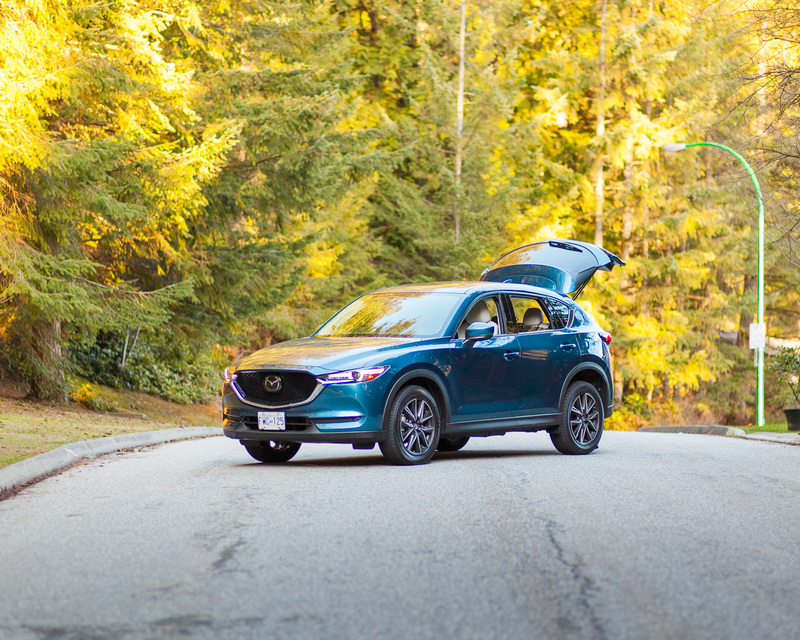 When activated, CX-5 would keep its distance from the car in front of you even to a complete stop. It also gently vibrates your wheel when it detects that you have drifted from your lane and slightly pushes you back. These are useful features for long distance highway driving but I usually prefer to have complete control of my car. 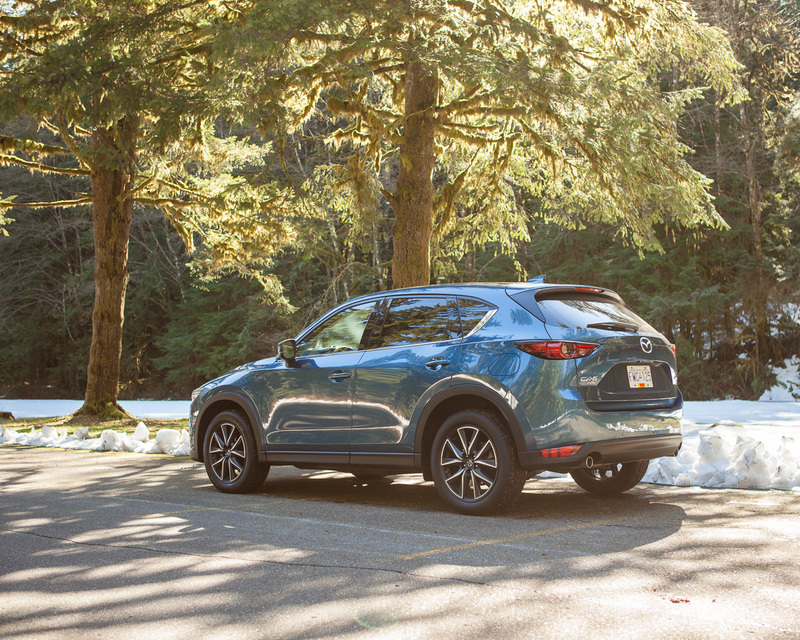 This is where the CX-5 shines. 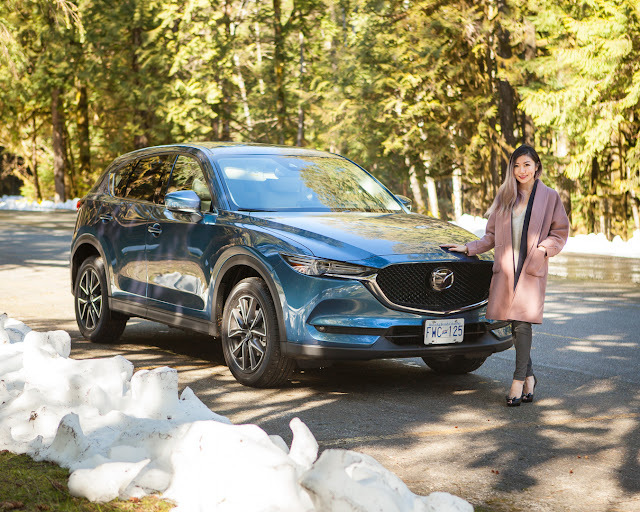 Mazda has always been known to produce fun to drive cars (zoom-zoom), but they have also found the balance between great handling and ride comfort in the 2018 CX-5. The steering is precise and the car feels very composed. The CX-5 drives more like an premium European car in that regard. The throttle response is quick and the floor hinged foot pedal is a joy to step on. The engine horsepower does feel slightly underpowered, but the ride, handling, and steering more than make up for it. I can’t say that I have noticed the G-Vectoring Control kicking in, but the car comes alive on curvy roads. It really doesn’t drive like an SUV and that is not easy to achieve. The fuel economy has been excellent in real world situations. Through our 450km of city, mountain, and highway driving, we were about to achieve an 9.7L/100km average fuel economy. Mind you, I was not easy on the pedal. 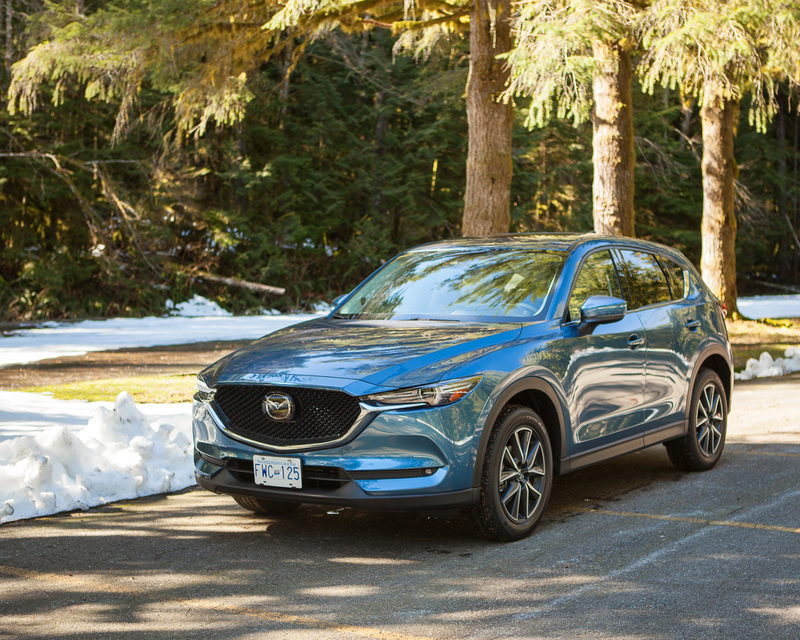 The 2018 CX-5 is a very functional car. There is plenty of storage in the cabin. The center armrest has a deep tray, and all four door pockets are large enough to hold water bottles. The rear passengers also have access to a fold-down armrest with cup holders, and large seatback storage pockets. I would like the glove compartment to be larger, but a smaller glove compartment allows the front passenger to have more leg room. 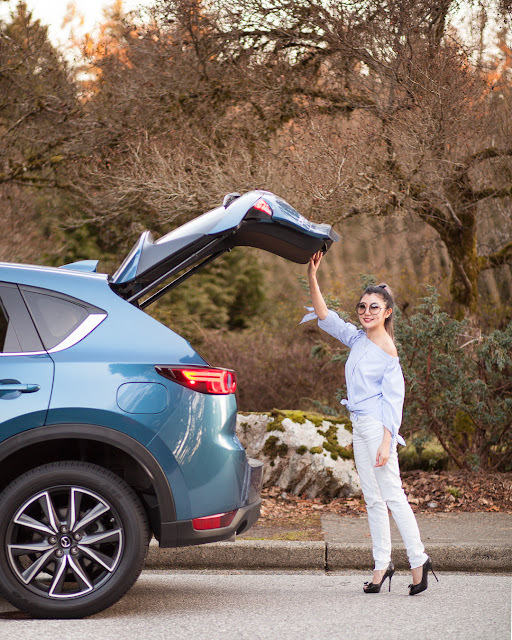 The rear cargo space is just adequate for a small a SUV, but once you fold the rear seats down, you can fit most things you will need on the road. I like the fact that the rear seats can be folded complete flat and the action levers are in a easy to reach location. I do wish there is a foot activated liftgate, my hands can get quite occupied carrying camera equipments. In conclusion, the 2018 Mazda CX-5 looks and feels more expensive than it is. It drives and handle like a premium car, and has excellent fuel economy. It is one of the safest vehicle in the segment and comes standard with a slew of advanced safety features. It provides plenty of functional space and has a driver friendly infotainment system. Most importantly, the 2018 Mazda CX-5 provides all that at a very competitive price.